The expansion of ”audit culture” in public sector governance is well documented, including its implications for caseworkers whose performance is constantly monitored. Transparency is an inherent part of the audit culture, yet there are fewer studies researching how the ideal of the transparent organization plays out in everyday life in welfare bureaucracies. 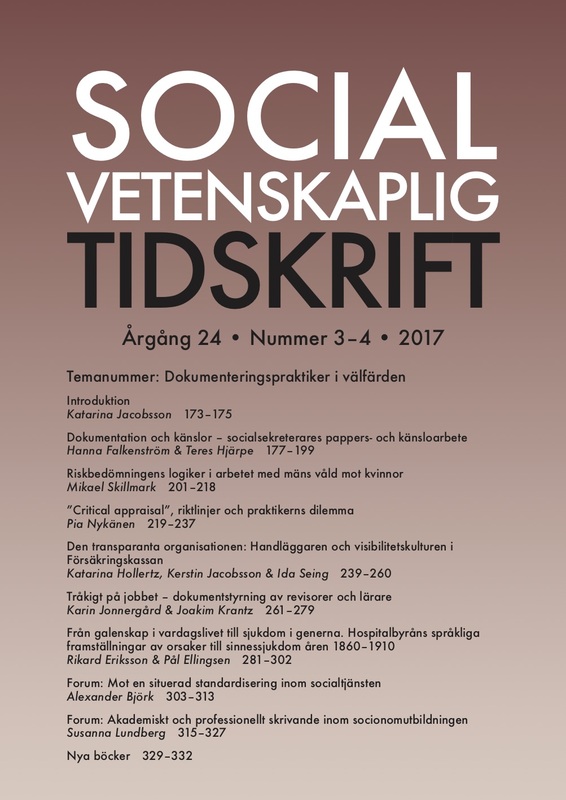 Drawing on ethnographic research in five local offices of the Swedish Social Insurance Agency, this article investigates how the transparency ideal is enacted on an everyday basis in this agency. The analysis reveals how the transparency ideal penetrates the organizational life in a much more pervasive way than is usually acknowledged in the audit society literature. Special attention is given to the relevance of a horizontal dimension of transparency. It is argued that the horizontal dimension of transparency is a central aspect in relation to goal achievement and the normative governance of the caseworkers. However, even if the transparency ideal is central to the internal organizational life of the Swedish Social Insurance Agency, transparency is much less salient in relation to clients and the outside world. The article explores this organizational regime of visibility, as established in everyday social interaction as well as in organizational routines.